The global manganese carbonate market bears a highly fragmented vendor landscape, says Transparency Market Research (TMR) in a recently published report. This can be attributed to the presence of a large number of small- and large-scale companies in the manganese carbonate market. Zncus Chemical Co., American Elements, GFS Chemicals, and Alfa Aesar are the dominant players operating in the global manganese carbonate market. A key strategy adopted by players in the global manganese carbonate market to outshine their rivals is constant product development along with expanding manufacturing capacity for satisfying consumer preferences. The competition among players are getting intensified due to the existence of several large players who are concentrating on expanding their production capacities through capitalizing on untapped opportunities in developing economies. They are focusing hard on research and development for developing new products to steal a march over competitors. Regulating costs along with delivering quality manganese carbonate is a key strategy of most businesses present in the global manganese carbonate market. According to experts from TMR, the global manganese carbonate market is expected to gain revenue worth US$464.1mn by the end of 2023. Experts project this growth to occur at a promising CAGR of 4.2% during the forecast period from 2015 to 2023. Among the various applications, agrochemicals account for largest share and is also expected to boost the global manganese carbonate market during the forecast period. This is because of rising need for plant fertilizers and increasing demand for crops treatment which are suffering from manganese-deficiency. 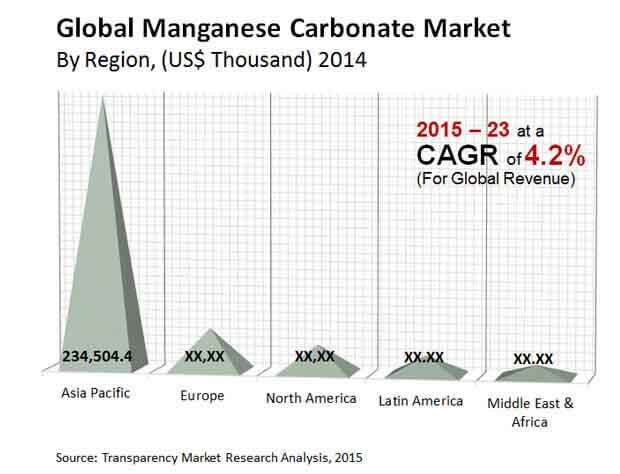 Region wise, Asia Pacific is expected to account for a leading share in the global manganese carbonate market in the coming years. This is attributed to rising use of manganese carbonate coupled with flourishing farming sectors in the region. Manganese carbonate is a chemical compound which is highly water-insoluble. It is basically a compound of manganese which can be changed into other manganese mixes such as manganese oxide trough calcination. Such chemical compound can be found in various colors such as yellow, pink, red, brown, and gray. Manganese carbonate is extensively used in various industries such as agriculture, and homeware. Manganese carbonate has various applications such as glaze colorants. However, growing use of manganese carbonate as agriculture micronutrient, rising demand for micronutrient fertilizers for crops, and increasing need for manganese carbonate in porcelain and ceramics products are the major factors driving the global manganese carbonate market. Furthermore, rising homeware industry, growing disposable income, and increasing demand for concrete staining for keeping home surfaces decorate, durable, and simple are also fueling demand in the global manganese carbonate market. A few challenges hindering the growth of the global manganese carbonate market are high manufacturing costs, low availability of manufacturers and their signed agreements with mining companies. Nonetheless, a persistent demand for easily maintaining home surfaces, and growing adoption of manganese carbonate in various industries are believed to help overcome these challenges in the near future. The review is based on a market research report by TMR, titled, “Manganese Carbonate Market - Global Industry Analysis, Size, Share, Growth, Trends and Forecast 2015 – 2023”.